Sheila Chandra (born 14 March 1965) is a retired British pop singer of Indian descent. In 2010, she was rendered effectively mute by Burning Mouth Syndrome. Sheila Chandra was born in London. She first came to public attention as an actress, playing Sudhamani Patel in the BBC school drama Grange Hill from 1979 to 1981. As a teenager she formed the band Monsoon with Steve Coe (who became the band’s producer) and bassist Martin Smith. Monsoon created a fusion of Western and Indian pop styles. The band recorded its only album, Third Eye, in 1982 from which it had a surprise hit single, “Ever So Lonely”, which peaked at No. 12 in the UK. Monsoon followed-up with the single “Shakti,” which peaked at No. 41, but this was to be the band’s final charting single. The album also includes a cover of the Beatles’ “Tomorrow Never Knows”, featuring the distinctive EBow guitar sound of Bill Nelson. Resenting pressure from their record company over musical direction, Monsoon dissolved in 1982 and Coe and Smith set about promoting Chandra as a solo artist on independent Indipop Records. Chandra went on to release a number of albums in the 1980s, at times experimenting with her voice as an instrument through a range of techniques. After a creative split with Martin Smith, Chandra released three albums on Peter Gabriel’s Real World label —Weaving My Ancestors’ Voices (1992), The Zen Kiss (1994), and ABoneCroneDrone (1996). In the 1990s Chandra decided, having been a studio artist exclusively, to give concerts for the first time, and concurrently released a trilogy of albums on Peter Gabriel’s Real World label. These were in the minimalist solo voice and drone style, which she developed especially for live performances, so that she could perform alone on stage with only the occasional taped drone for accompaniment. Martin Smith was no longer actively involved by this time. 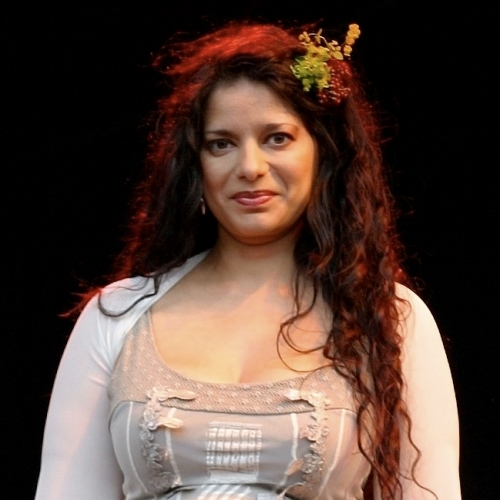 Drawing on similarities of structure between Indian ragas and English folk melodies, she started to incorporate many British and Irish traditional songs and techniques, as well as other vocal styles and techniques from around the world. In 1990 Chandra interrupted her sabbatical to record a single, “Raining”, with the folk-synth band Ancient Beatbox which also appeared on its self-titled album. In 2000 she contributed two tracks, one a cover version of Tim Buckley’s “Song to the Siren” and the other a remix of her solo track “Ever So Lonely/Eyes/Ocean” by Stephen Haig, to the album Gifted on Real World Records. Chandra is a respected performer on the world-music scene and remains active into the 21st century. In 2001 she released a collaborative album with the Ganges Orchestra titled This Sentence is True (The Previous Sentence is False) based on her two experimental EPs with that group. 2002 saw the release of a remix of her original hit single “Ever So Lonely” retitled “So Lonely” by the band Jakatta. It charted at No. 8 in the UK. In 2002 she performed a song titled “Breath of Life” (retitled “The Grace of Valar” in its 2006 release) with Howard Shore for the The Lord of the Rings: The Two Towers soundtrack. In 2007, she recorded two songs for Simon Emmerson’s project the Imagined Village, which set out to reinterpret traditional British songs using a wide range of contemporary British musicians. She also appeared with the Imagined Village on a concert tour of Britain in 2007. In 2009, Chandra began experiencing symptoms of what was eventually diagnosed as burning mouth syndrome, as a result of which she is unable to sing, speak, laugh or cry without suffering intense pain. She has thus been rendered effectively mute. As a result of her illness Sheila is now completely retired from music. She has turned her attention to writing self-help books, the first of which, Banish Clutter Forever – How the Toothbrush Principle Will Change Your Life, was published in 2010 (she is currently working on a sequel).